Delicious no added sugar tangy blackcurrant preserve: a daily delight! More blackcurrant and less sugar, this fruity preserve is the ideal spread for your toasts and delicious topped on your yogurt! These fruit preserves only contain natural sugar contained in the fruits. This product received a "Great Taste Award". Considered as the Oscars for beverages and food products, the "Great Taste Award" comes from an annual UK competition organized by the "Guild of Fine Food". Folláin is located in the heart of the rural area of County Cork, in the southwest of Ireland. “Folláin“ is the Irish word for "wholesome". 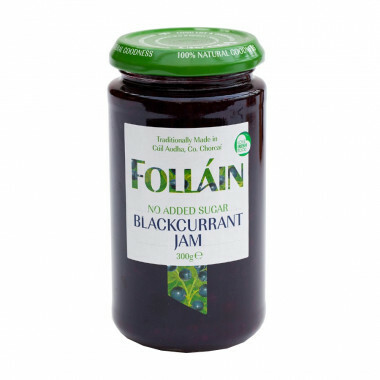 Established in 1983, the company strives to produce quality jams, fruit preparations and marmalades, based on Irish traditional recipes that have been passed from one generation to the next for more than 100 years. Folláin products do not contain artificial ingredients and flavours, no colourings, preservatives, additives, GMO, fat or gluten. They are suitable for vegetarians. Jams and marmalades contain an average of 50% real fruits. Ingredients: blackcurrant 50%, unsweetenend grapejuice, gelling agent: fruit pectin. Sweetened with grapejuice. Contains only natural sugar contained in the fruits. Refrigerate after opening. Consume within 21 days after opening. Awarded by Great taste 2018.